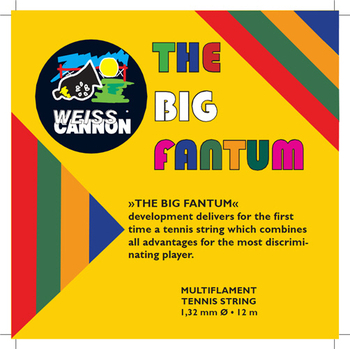 Guts & Glory Tennis Catalog > Über Strings > WeissCANNON > WeissCANNON Sets > WeissCANNON "The Big Fantum"
WeissCANNON continues their development of innovative offerings with a new multifilament string that matches the quality we have come to expect from this company. While "The Big Fantum" may have a name that is a bit unusual, the performance is stellar. We continue to be impressed with both the poly-based and synthetic offerings that Siegmund Weiss and his team continue to pump out. Construction: A premium multifilament where the center core has received a special treatment/coating that other multis do not utilize. The Big Fantum also using two distinct outerlayers applied with a new technique to provide extra power and access to spin. Advantage: This string offers plenty of power combined with abundant feel. The outer coating allows it to generate more spin than is typically associated with multis. The inner coating also helps this string maintain extremely well by multi standards. Tension Recommendation: Due to the high elasticity of this new offering, WeissCANNON recommends a tension increase of at least 5% over your preferred multi tension. Why we carry this string: We can not recall Siegmund Weiss, the founder and developer of WeissCANNON, being more enthusiastic about any string he has introduced to us. After playtesting, we understand his enthusiasm. This string offers smooth power that is extremely comfortable as well as spin potential and control that is outstanding.